Last week I wrote about how I avoid the use of sunscreen for most of the summer so that I can soak up the benefits of all that sunny goodness. As I sat down to write this week, I thought…speaking of kids. If you remember, the sun is a great source of vitamin D (which is important for your immune system and a ton of other stuff). It is a critical part of disease prevention. The sun can also work as a natural anti-depressant. So I encourage you to let your kids spend some time in it unprotected. The best times to do this are in the morning and late afternoon. We opt to play outside pre-11 am and post-3 pm each summer day with a few rare exceptions. My oldest daughter may get out of the sun by 10 am as she is fair complected. 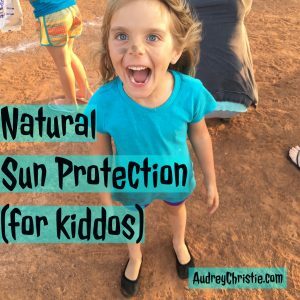 If kids do have to be out during that time, opt for light UV protectant clothing OR a sunscreen that is free from petrochemicals (yes, you will have to go to your local health food store). The Honest Co. has a good one here. I actually found this one at Costco again this week for half price! So you may check there, as well. It is also what I opt for on my kids. And here is another of my favorites here. Raw Elements can be hard to rub in though, but their face stick is pretty darn handy. My adult routine includes an internal sunscreen. My kiddos aren’t old enough to take Astaxanthin (but they do take Omega 3 and Vitamin D) so I am slightly more liberal with sunscreen with them, but only slightly. The same basic principles apply, and when choosing sunscreens we opt for the safest we can find. 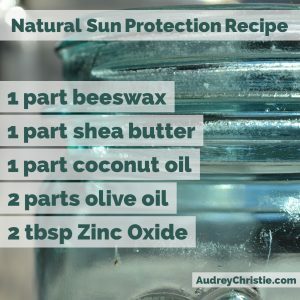 You can also make your own sunscreen, I don’t often recommend it because its not a super practical solution. I have found that people make a batch and then the rest of the summer buy the cheapest aerosol can around because they run out or realize its kind of a pain. If you want to give it a go, please have some back up nice and natural sunscreen on hand too. Optionally you can add up to a tsp of Raspberry Oil, Vitamin E Oil, or Carrot Seed Oil. You can also add Essential Oils (no citrus). Combine all of the ingredients (expect the Zinc Oxide) in a double boiler (you can use a glass jar + medium saucepan), stir as they melt together. Once melted and mixed, stir in the Zinc Oxide. Allow to cool. After each summer throw away the remaining sunscreen. **You can also pour this into a deodorant container (like a roll-on stick) which makes it more handy to use, but you gotta use more caution because it can melt and run all over your swim bag.